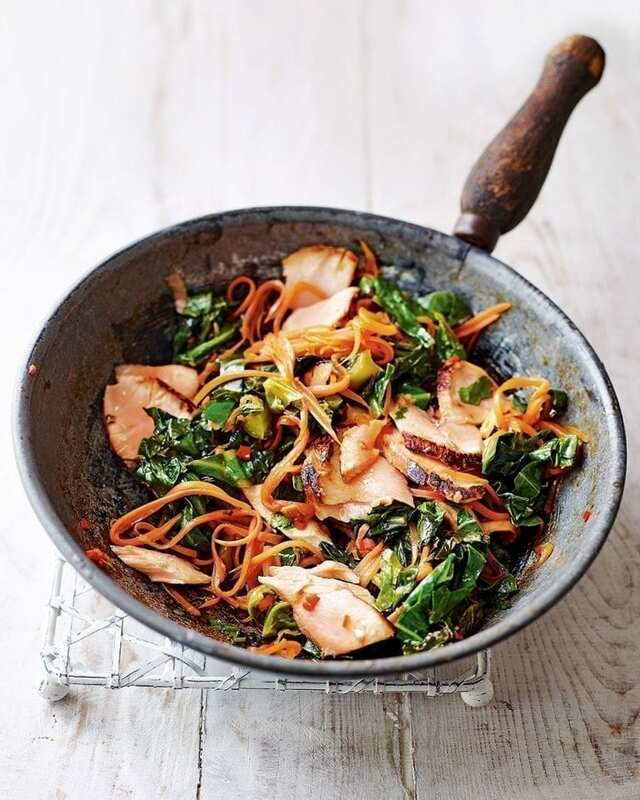 A quick and nutritionally packed gluten free stir-fry recipe with bags of teriyaki and aromatic flavour. Mix the teriyaki sauce, lime juice, zest of 1½ limes and the soy sauce in a small bowl. Put the salmon in a shallow dish, pour over the teriyaki mixture and leave for 5 minutes. Heat the sesame oil in a large frying pan over a high heat. Add the chilli, ginger and carrots, fry for 1 minute, then push them to the side of the pan and add the salmon fillets skin-side down (reserving the marinade). Cook for 5 minutes, gently turn over the fillets and cook for 5 minutes more, reducing the heat if they start to burn. Remove the salmon from the pan, peel off the skin (discard), flake the fish into pieces and set aside. Keep stirring the carrots, then add the seasonal greens with a splash of water and the leftover marinade. Stir-fry for 3-4 minutes until the greens wilt, then stir through the coriander and flaked salmon. Season to taste. Serve with the remaining lime juice and zest.